May 30th, 2015 (1:13 PM). Edited November 12th, 2016 by 80C. Welcome to the Region of Frejo! This is a hack ROM based on Pokemon Red (USA), the author is 80C, this is his first hack ROM. Pokemon Grape's development began in 2012, it had 3 Demo releases, Demo 1 and Demo 2 were released during 2013 while Demo 3 was released on Christmas 2014. Each Demo release featured huge differences and improvements. This is a Total Overhaul hack that changed drastically the original game almost beyond recognition and it features advanced Assembly Features - most of them have been implemented for the first time in a Gen1 Hack ROM like Physical-Special split attack, new evolution methods etc etc etc. Later Gen1 hacks were influenced by this hack as their authors affirmed in various occasions. Many events of the game are similar to the events that occur in Pokemon red (although in a different order) but those similarities will be explained later in the game's storyline. The hack is pretty hard, especially at the beginning of the game, and the gameplay experience offers way more hours of gameplay than the original Red Version. This is the last hack that has been realized with obsolete methods like hex editing etc. Many fans considered this hack the "spiritual successor" of Gen1 hacks like Pokemon Brown and Pokemon Team Rocket Edition. Indeed, since its first moment Pokemon Grape started as a tribute to the old-fashion and retrò Pokémon Hacks. Actually Pokemon Grape is widely considered by both critics and fans around the world one of the best Gen1 hack ever made, it won several prizes during these years, the last Demo release received critical acclaim. The hack is about to be ended but there are still a lot of details to be adjusted for the Final v1.0. The Pokemon League Zone, located on the border of the Regions of Frejo and Kelgo, is famous for being the headquarter of one of the most prestigious Pokémon League, it is an important reference for Pokémon trainers all over the Pokemon World. The leaders of these two regions are going to declare war to each other for some unknown reasons. Finally, they agree to start a competition, a Pokemon Tournament to decide who among the two will be the owner of this Zone: the competition states that who can gain all the 8 badges of Frejo and defeat the Elite Four will be the owner of Pokemon League Zone. In order to create an equal competition they agree on assign a rookie trainer as contender, one per region. Unfortunately, before the starting day, some bad guys have destroyed the Pokémon Database located in the Pokémon League Zone. Pokédex data and parameters are now lost. Monetary values and Pokémon trading collapse. Everything is in chaos. To make things worse than ever, some renegades from Team Rocket who had fled the Region of Kanto the previous year after the Silph Failure are compromising this competition with the help of some fanatics who call themselves "The Epsilon Program". On the next day, you gain control of your character, Frejo's contender, a former baseball player, his name is Marquis but you can assign him whichever nickname you like. His rival and nemesis is a psychopath teenager named Paul that due to some personal issues won't hesitate cheating and dirty tactics. This Paul actually may or may not be the same "Paul" from the Pokémon Anime series. These guys are not your generic mute characters from the previous Pokémon games. There's also an unknown Pokemon professor put in the competition at the last minute by the Pokémon League: he is Professor Bek, allegedly Samuel Oak's cousin. The Professor is supposed to give the contenders an extra task: complete the Pokedex in order to restore the lost Pokemon Database data by collecting every Pokemon specie during their quest. This is an extra task that you can either ignore or accomplish, in any case this will decide your ending (Good Ending vs Bad Ending). Hurry up or those two regions will not be here anymore. Is this supposed to be yet another Pokemon Red hack with the SAME background stuff like Evil Teams, powerful legendaries, secrets, unlockables, rivals and fat guys who love technology? Why there's STILL Team Rocket behind this (this time without Giovanni)? And who is "Kifflom" and its "Epsilon Program" and what it has to do with Team Rocket and all of this? There's really a secret underground passage under Megan City's Museum? Is this Hack ROM such good? There are really OVER 240 Pokemon species?? Well, at this point I suggest you to find the answers by yourself by playing the game. 10 Extra types: Steel, Dark, Fairy, Atom, Wood, Wind, Gas, Sound, Light and Bone! Extra intro screens before the standard introduction. EXP Bar like in Gen2+ - Thanks to Danny-E 33 for the original asm routine that I later fixed by myself since the original one was glitched. Animated Waterfall mechanics like in Gen2 Games - once again me first! Damage Counter during battles in Final Fantasy-fashion! I implemented the Hyper-Flying-Jetpack too but the risk of flying out-of-bounds was too high so I disabled it. Nevertheless, it made it into the game as a cameo. I've bug-tested this beta myself with a little help from a few Beta-Testers, but there's always the possibility that The Beta testers missed something. If you encounter any bugs, feel free to send me a Private Message. *Many Pokemon can learn X-Scissor even if they're not supposed to do so. *Gen3 and Gen5 Pokemon don't have a MiniOW icon in the party pokemon. *3 Pokemon (gastly, Magnemite & Doduo) have glitched backpics. This problem was already fixed for the Final release, I'm very sorry about that, adding manually 499 compressed pics is really frustrating and boring, you know. Smilesoft\Sintax - The original player's sprite comes from Pokémon Diamond\Jade, which is a pirate bootleg of Smilesoft's Keitai Denjuu Telefang (Electric Monsters Telefang), thanks for pointing that out. the other ones are pokemon from Gen3, Gen5 and Gen6 and there's the other fakemon. You need an utility such as Luner Ips to patch. 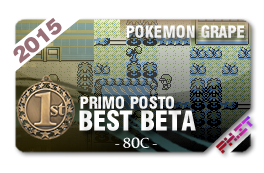 POKEMON GRAPE DEMO 3.1 AVAILABLE! CLICK THE BANNER & DOWNLOAD THE BEST GEN.1 HACK ROM EVER MADE! May 31st, 2015 (8:21 AM). All of my yes! 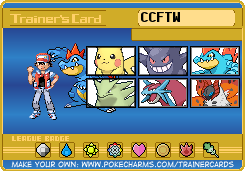 I'll play this after my current and next Nuzlocke. May 31st, 2015 (12:38 PM). this looks really nice! It's always interesting to see how much effort is put into these GB(C) hacks. I presume you've implemented a day/night system? I don't really care for the sidescrolling feature, but it's nice on its own. Is there trading functionality? May 31st, 2015 (5:06 PM). Question, though, if we play through the Demo and have a save file, will it be compatible with the final version? Watashi wa Phantomness desu. Hajimemamuke. Douzo yoroshiku. I created Championshipping (Lance x Ash/Red). My webpage is www.geocities.com/shadowphantomness. Fanfics galore + Lance shrine! June 1st, 2015 (5:13 AM). Edited June 1st, 2015 by HidoranBlaze. Ok don't get me wrong, I'm not bashing your hack at all, and I haven't really played your hack yet, but saying this hack you released on Pokecommunity a few days ago is considered the best Gen 1 hack ever kinda rubs me the wrong way. It'd be like Gamefreak releasing ORAS and then saying a few days later that fans consider ORAS one of the best Pokemon games in history. Obviously, you released this hack somewhere else a few months ago, but you get my point. I'm not saying your hack doesn't have the potential to become one of the best Gen 1 hacks out there, because it probably could become a famous Gen 1 hack. I'd just rather you say stuff like that when you get a bigger fanbase here on Pokecommunity and you can actually back up your statements. Good luck with your hack. EDIT: Ok derp, I didn't realize you had another Pokemon Grape thread that got closed. My bad. But I think my point still stands, because I'm pretty sure a lot of people here and in other Internet places haven't heard of this hack. June 2nd, 2015 (11:58 AM). Meh. Hate me if you will. Why you steal my California Gurls song. "We're not here for a long time, we're here for a good time!" June 2nd, 2015 (4:36 PM). 80C !!! You've come back! I found Demo3 on another site so I've already played most of it. THIS IS THE BEST, COOLEST, MOST ENJOYABLE, MOST INNOVATIVE GEN 1 ROMHACK I'VE EVER SEEN! PLEASE do not stop developing Pokémon Grape! I LOVE this romhack, 80C. It's beyond impressive for a Gen 1 hack. If there's any romhack I would actually transfer to a cartridge to play on a real GameBoy, this would be #1. June 2nd, 2015 (11:52 PM). Enable visitor messages you bum, I can't reply! Anyway, can I take up your offer of helping me with the ASM in my Red Hack? Currently trying to do something and failing hard. Keep up the good work with Grape though. June 3rd, 2015 (11:27 AM). June 3rd, 2015 (1:22 PM). June 12th, 2015 (1:01 PM). Finally a real videogame shop: every mart has been overhauled and now every mart is unique. Here's an update of the "Walking on the railroad is dangerous!" Area, the new palette of colors has been improved. Waterfalls are animated just like in WIZARD PEAK. Fishing in the statues has been completely fixed, you can still surf (and do fishing) on normal water too. June 25th, 2015 (5:17 PM). Those screenshots look awesome, 80C! Since demo 3.1 will be out in July/August as you say, how complete will 3.1 be? You mentioned before that demo 3.0 was 55-60% of the game... Have you got a percentage for 3.1?? June 28th, 2015 (10:39 AM). Demo 3.1 it's an overhaul of Demo 3.0 and it features some of the latest pubished features (like Ice-sliding, Bone type), somemap redesigns, a new dungeon, some new wild pokemon (this time including even Gen3 Pokemon), a new city and a previously unavailable Gym (the 6th Gym, in Gondwan City); it includes also a lot of fixes for some annoying bugs from Demo 3.0 (expecially the graphical glitches regarding the NPCs' sprites and Party Pokemon's Mini-OverWorld that happens under a particular circumstance). Demo 3.1 features about 60% of the complete game. Savegames from Demo 3.0 are compatible with Demo 3.1. I completed Demo 3.1 yesterday, all I need now is beta-test it and make sure that everything's fine. Fortunately videogames don't feature an odor option. In any case, if you didn't get a Super Rod don't worry: this is the right place for every aspiring fisherman. Cool custom graphics as usual. This is is just a portion of what you'll find in Demo 3.1. June 28th, 2015 (11:55 AM). The palettes, borders, sprites, mapping! Grape looks amazing as usual. Can't wait for Demo 3.1 to be released. Keep up the great work! July 7th, 2015 (8:34 AM). July 15th, 2015 (10:38 AM). Amazing hack, man. It clearly looks like you went all out with this hack, introducing tons of new features that would not have been in the previous games. I do have a few questions, though. First of all, what's this 'Hyper-Flying-Jetpack' you're talking about? Does it really allow the player character to fly around the area? I know you didn't implement it in the end, but I'm still curious - if you DID implement it, it would make your hack revolutionary, I believe. Secondly, why not ditch the Geodudes in the first cave? Since that cave comes just after you get your Level 5 starter (who may very well be a Charmander, and all of who lack elemental STABs at that point anyway), and since Geodudes resist their Normal-type attacking moves, it might be best to ditch them altogether and just keep Zubat and maybe some other relatively weak Pokemon in the cave. Maybe something like Patrat would do, I could see it living in a cave. July 22nd, 2015 (9:27 AM). Edited July 22nd, 2015 by 80C. Thanks, I appreciate the fact that at least my work on it isn't wasted time. The Jetpack was simply an object that simulated the "walk through walls" glitch and replaced the player's sprite (like the bike does) but I had to discard it mainly due to the fact that the risk to fly out of bounds was too high. Actually if you choose Charmander you can grind by defeating Paras, alternatively grind in Route 51 by defeating Oddish or similar wild Pokemon. In Demo 3.1 there will be a few unseen surprises that I didn't show in the previous screens. A few words to the wise. July 22nd, 2015 (11:21 AM). Why does Route 61 have wild Machoke? They're below 20, and it's before the second gym. Doesn't make much sense. Could you replace them with wild Machop? Come play The Great Pokemon Battle 4! July 24th, 2015 (11:29 AM). Finally that GYM is available. This time I offer a better Pokemon. Another screen about the revamped Frejon Tunnel. You may find some new and useful items inside. Ice mechanics from Gen2 have been included. Everybody forgot about them: they're already available since Demo3, they evolve from Eevee only in a certain area (just like in next-generation pokemon games), many NPCs give you a hint about it. Finally Quartz Town looks snowy. A couple of screens from the new location, Silten City. If everything proceeds as planned Demo 3.1 will be released this weekend. This has been fixed in Demo 3.1. Now wild Pokemon are stronger than in the last beta and they make more sense now. July 24th, 2015 (11:48 AM). You nicknamed Bagon "Spyro"? Nice! If only three was a way to play this on colour on my android. Good luck, though! July 25th, 2015 (2:38 PM). Demo 3.1 has been released! The .zip has been updated to the newest version, the link remains the same. ReadMe file contains now detailed info about the hack, how to play etc. The SaveGame from the previous version is compatible with this new release. If you have a previous savefile and want to continue from that one make sure to save in a PokemonCenter in the old version, and then continue the game with the newest version. This is necessary due to the fact that many maps have been changed and you may eventually be stuck on a tree or something similar if you don't follow this instruction. Final Version v1.0 comes out as soon as it's ready and fully tested. Don't bother me asking when the Final version comes out, please, be patient. July 26th, 2015 (12:47 AM). July 26th, 2015 (4:43 AM). are u planning to change mons moveset to 6th gen or keep gen2? July 26th, 2015 (11:57 AM). July 29th, 2015 (11:27 AM). I changed Pokemon Movesets in order to match mostly Gen3 but also the next generation games' movesets. Actually it was a reference to Grand Theft Auto San Andreas rather than GTA V (infact Demo 1 has been released before GTA V's release and the mention was already in there). Yes, this hack is full of references.